This photo was taken around 1907 in the old school yard. The headmaster standing at the back on the right is Mr Fell. 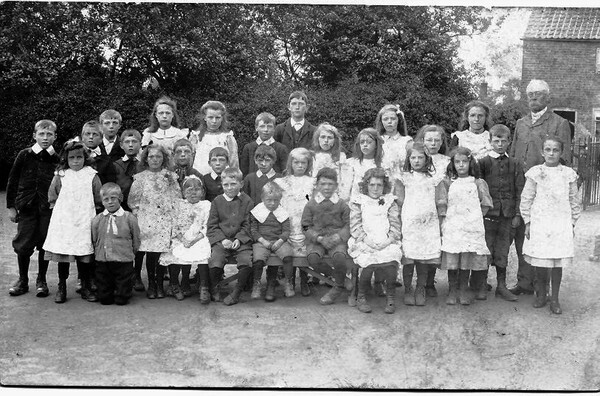 The girl in the centre and in front of the tallest boy is Ada Needham. She was my grandmother. Moving to the right is her sister, Hilda, and right again is her sister Gert. Another older sister, Edie, is at the back with a ribbon in her hair. I knew my grandmother very well indeed. She was born at Col's Pit, a much extended and altered cottage later called Turkey Cottage. Ada was the middle child of nine. She lived nearly all her life in Lutton and died in 1990 aged 87. I knew Edie quite well, but the others less so. What a super photograph. Did you know your grandmother & Aunts well?